As you're researching your family history, you may find yourself wondering, "What do historical maps show?" These important documents can provide clues about your ancestors and give you insight into where and how they may have lived. What Do Historical Maps Show the Genealogist? Historical maps are one of the great overlooked resources for genealogists. Learn how to use these tools to discover hidden facts about your family's history. Perhaps one of the best uses for historical maps is tracing the journey of your ancestors. If you've looked up your family members in census records, you probably have a pretty good idea of the places where they lived. Census records provide your ancestors' location every ten years, and a historical map can help you trace their route across the state or country. Because place names and boundaries change with time, historical maps are the most accurate way to follow this migration path. To begin, select a map that covers the area and time period in which your ancestors lived. Make a copy of the map, and mark the locations associated with each census record. This will give you a visual representation of your ancestors' journey. While you can gain some information about location from current maps, only historical maps will help you understand how an area looked during a particular period of time. You can use a map to determine the location of the frontier during a time period or the extent of the railroad network during a particular decade. Even rivers and lakes may be different, since man-made canals and dams can have a dramatic effect on the landscape. To understand the setting for your family history, find a map that shows the area when your ancestors lived there. You may want to compare this map to a modern-day version in order to highlight the ways in which things have changed. Land ownership is an important part of family history and national identity. Many families purchased land from the government or railroads, and others filed for claims associated with the Homestead Act. County maps sometimes showed plats or land ownership diagrams that can be very useful to modern-day genealogists. To put these records to use, you'll need to know the county and township in which your ancestor owned land. Then you'll need to find your ancestor's name among the landowners. Finally, you'll compare the historical map to a current version, giving you an accurate location for the farm or property. Another important piece of information found in historical maps is the location of county, state, and national boundaries. Some borders, such as the national border between the United States and Canada, moved several times over the course of history. National boundaries weren't the only lines that shifted over the years. You can expect to see changes in state lines and county lines as well. This can have a profound effect on genealogical research, since these locations are important for finding historical records. In addition to helping you pinpoint the county, state, and nation your ancestors called home, old maps can help you find the records associated with your ancestors' lives. These maps often show the county seat or state capital, which may have changed over the years. These city designations are also important because they may indicate where public records are housed. Most counties sent the records to the county seat, but changes in the designation may make it hard for you to find those records. An old map could be just the clue you need. Local libraries often have plat books showing land ownership, as well as general historical maps of the area. 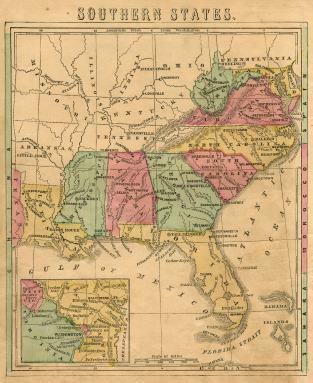 FamilyHistory 101 has links to many historical maps, including animations of boundary changes by state. David Rumsey Map Collection includes more than 22,000 maps, many of which are available for viewing online. Historic Map Works has over 250,000 maps, most of which are available for purchase. State archives often include historical maps of the region. A historical map can provide many clues in your genealogy search.